Quintana Roo on the sun drenched shores of Mexico's Caribbean coastline has long been a mecca for cave diving and exploration. Since the early 1980's, explorers have pushed back the darkness to reveal a frontier so vast that it may never be fully surveyed. The underwater passages and labyrinths are among the most breathtaking in the world. These caves, filled from ceiling to floor with incredibly crystal clear water as well as beautiful and fragile stalactites, stalagmites and columns, let divers experience an underwater world unlike anywhere else on earth. Most of the systems are quite shallow, with maximum depths between 60-80 ft (18-25 mts). Average depths of 30-40 ft (9-12 mts) allow longer bottom times with little or no decompression. A unique aspect of many cave systems is the halocline. This phenomenon occurs when salt water penetrates through the limestone from the nearby Caribbean Sea, meeting with the fresh water and creating an amazing visual effect. 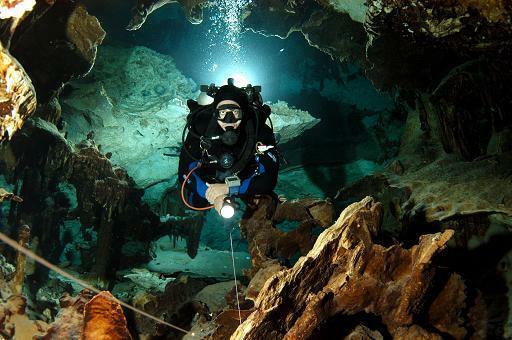 In the eastern part of Yucatan, there are over fifty different cave systems, with more than 300 miles of passageways to dive and enjoy. Three of the largest water filled cave systems in the world are located in this area: Ox Bel Ha (886397 ft / 270174 mts), Sac Actun (865462 feet / 263793 mts), and K´oox Baal (304409 ft / 93621 mts). 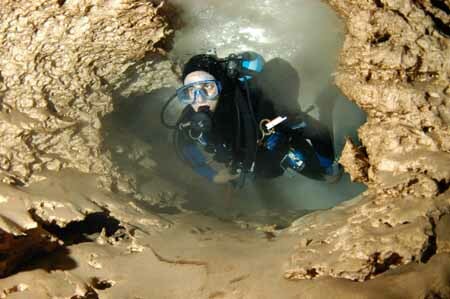 Guided cave diving is highly recommended because the local guide's knowledge of the sites maximizes your enjoyment and bottom time during the dive, increases the safety and conservation of the cave through detailed plans, and makes the logistics easier (tanks, oxygen, first aid kit, food, drinks, transportation, etc., are provided). Guiding allows the cave diving customer to see the most of what the cave systems have to offer, relax and enjoy with a knowledgeable and well informed guide. The only thing you have to do is dive and enjoy, we take care of everything else.